Occasion: This rose gold ring is suitable for any occasion, everyday wear, party, prom night, going out, weekend, date, bar, special occasion etc. Features & Benefits: A rose gold thin band ring with circle charm. The ring is suitable for every day and can be combined with other rings. 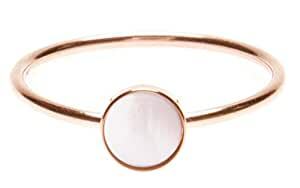 Material: This delicate ring is made of stainless steel with rose gold plated. Packaging and Jewellery Care: Each order is delivered in a high quality cardboard Happiness Boutique gift box. Please avoid contact with liquids. It is best to keep your jewellery in a jewellery box or in a sealed bag. Seller Warranty: 60-days return policy. Questions or concerns regarding the order will be answered within 24 hours. This delicate rose gold ring has a circular stone on top of its base. The pastel moonstone color of the stone is very feminine and mystical. The simple, but modern design of this ring makes it the perfect complimentary piece to any of your festive, casual and elegant outfits. This ring is available in ring size 55 (Germany) that is equivalent to size 7 (US/Canada), size O (UK/Australia), and size 15 (France). The ring’s inside diameter is 17.5 mm, and inside circumference is 55 mm. This product is antiallergic. Thanks to its robust and durable materials, this piece can be worn while swimming or showering. Over time, the piece may look a bit darker. This is due to regular body contact and oil from the skin. To keep your product looks its best, use toothpaste to clean it and then rinse it off with water. This will make sure your jewellery maintains its shine for as long as possible.